Dr. James Tan’s IVUmed scholarship experience in Dakar, Senegal was made possible by the generous support of the South Central Section of the AUA. During his time in Senegal, Dr. Tan was accompanied by mentor, Francis Schneck, MD. Dr. Tan, reflecting on his experience, reported, “We quickly got through our intake of 30 plus patients with efficiency despite some of us still recovering from severe jet lag. Amongst these we chose the most appropriate cases to proceed with and scheduled them appropriately on each of the operative days. Despite the facilities being much different from what we were used to we were quick to unpack and start cases the following day. It was clear from the get go that the aim of our time would be focused on training the local doctors new techniques and procedures. There was a willingness to allow the local surgeons to have as much hands on time and struggles as possible much like during our residency training. This would not be a time of pure observation. They would get valuable experience with cases they’d never seen before. Each day was long and tiring but at the end of the day there was a satisfaction I had in working with a great group of people as a team helping the kids we operated on. Featured above is a locally-made flyer posted in Dakar, Senegal, advertising the IVUmed pediatric urology workshop being conducted in Senegal at Hopital Général de Grand Yoff in Dakar. This is the fifth pediatric urology workshop that IVUmed teams have conducted in Senegal. 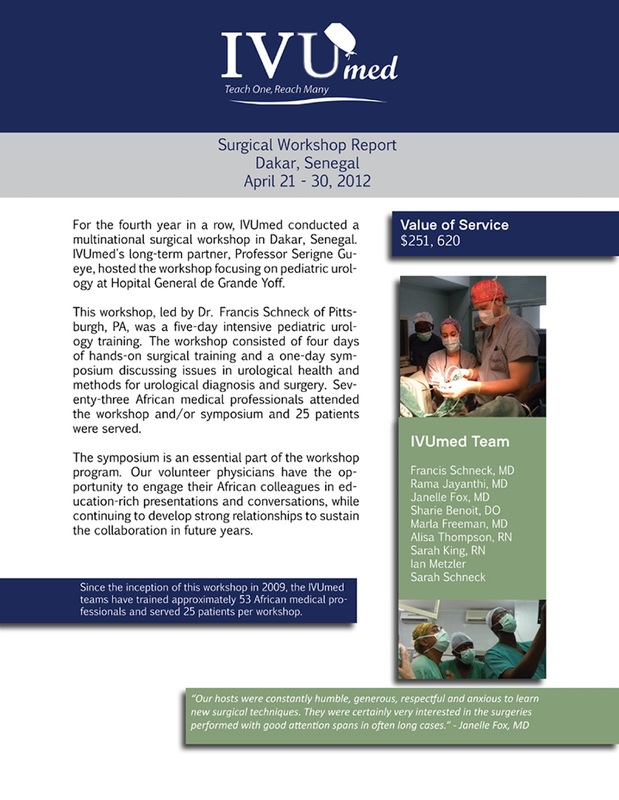 Each of the five Senegal urology workshops have been led by long-time IVUmed volunteer, Dr. Fran Schneck. Our team will be in Senegal through tomorrow, but early reports indicate that the patient care and workshop training of physicians and nurses in Senegal is going “very well”. We look forward to reporting additional feedback regarding this workshop and thank the IVUmed volunteers and staff who make this and all of our medical services possible.